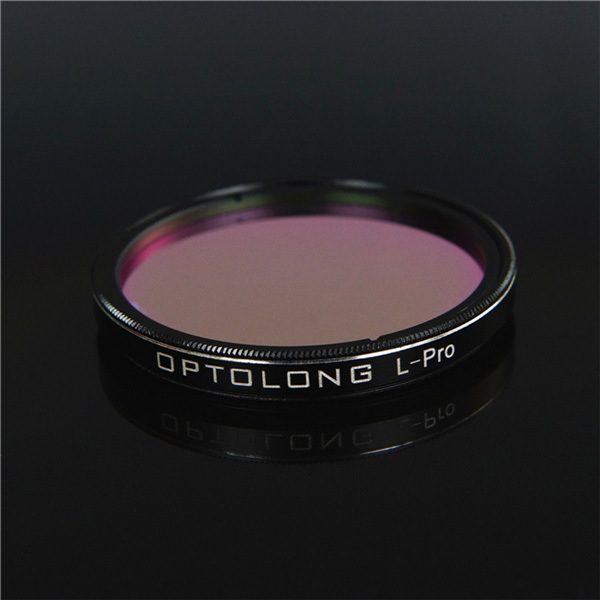 Optolong L-Pro Deep Sky Filter - 1.25"
Unlike other light pollution filters such as UHC and CLS, the L-Pro is multi-bandpass filter which offers better color balance by maximizing the transmission band. The balanced transmission allows astrophotos to be taken with minimal color cast in broadband emission objects such as galaxies, reflection nebulae and globular star clusters. L-Pro is an excellent choice for light pollution suppression. Works well on most emission nebulae, reflection nebulae and dark nebulae. I purchased the 2 inch Optolong L pro filter a few months ago. It has done a great job of taking care of the many street lights I have around where I take astrophotos. I used to use light shields to block as much of the light as possible. So far I have been able to not use the shields even with a 10 inch ota. The filter gives a good color balance without a lot of fuss. I have even had to up the gain setting in my camera and used 10 minute exposures. This is one of the best filters I have used for one shot color shots. I am using the ASI071 camera. Give wonderful balanced color when used with my Modified DSLR's and significantly reduces LP increase contrast. Excellent filter and I will buy another so both DSLR filter holders will have this installed. I have evaluated this extensively, and find that the L-PRO make a significant difference in contrast in emission nebulae, and a noticeable difference in contrast in other objects.